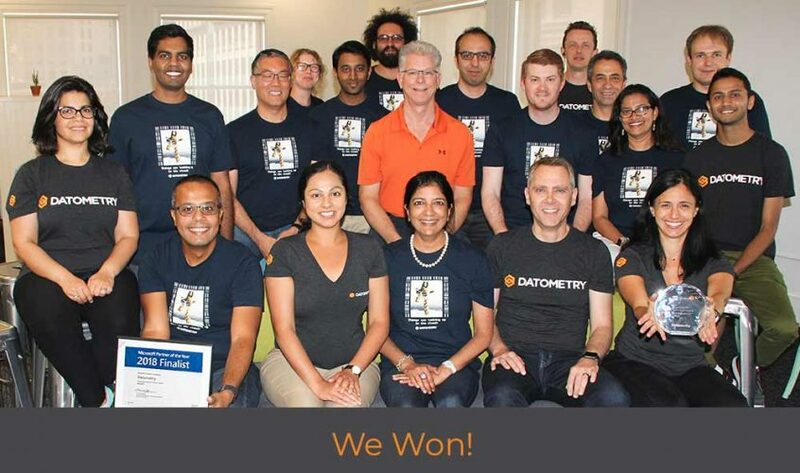 San Francisco – July 25, 2018 – Datometry today announced it has been named Winner of the Microsoft Cloud Innovation Data Estate Modernization 2018 Award. The company was honored among a global field of top Microsoft partners for demonstrating excellence for its data warehouse virtualization SaaS solutions enabling enterprises to replatform existing or on-premise data warehouses to Microsoft Azure SQL Data Warehouse in weeks, not years, and without rewriting applications. Datometry virtualization technology makes databases and applications truly inter-operable which means Global 2000 enterprises can replatform to cloud databases, such as Microsoft Azure SQL Data Warehouse, in weeks, not years, and without rewriting applications. The company’s solutions make the conventional approach of rewriting applications unnecessary, protect long-standing investments in mission-critical business logic, and enables enterprises to realize CAPEX savings swiftly. Azure SQL Data Warehouse is a cloud-based, high-performance, globally available, and lower-cost secure cloud data warehouse which enables enterprises to independently scale compute and storage through a massively parallel processing architecture designed for the cloud. The data warehouse seamlessly creates the enterprise hub for analytics along with native connectivity with data integration and visualization services. “We’re extremely proud and humbled to be named Cloud Innovation Winner by Microsoft among so many tier-one partners. This award is testament to the value we bring to Microsoft Azure. Solving replatforming—one of the most pressing problems enterprises face today—at a fraction of cost time and risk is as critical to Microsoft as it is to enterprise customers.” says Mike Waas, Founder & CEO of Datometry. Datometry (http://datometry.com/) is empowering global enterprises to gain competitive advantage by up-leveling their data management to become cloud-native quickly and effectively. With the company’s suite of SaaS solutions, enterprises can replatform existing data warehouses to the cloud at up to 80% savings of replatforming time, cost, and risk, and without application rewrite. Powered by Datometry Adaptive Data Virtualization™ technology, the company’s SaaS offerings include: Datometry Hyper-Q™, the flagship product enabling replatforming of existing applications on any cloud database in real-time; Datometry qInsight™, the only product in the market to provide unprecedented insights into data warehouse workloads; and, Datometry qShift™ automating the generation of optimized destination data warehouse schema.